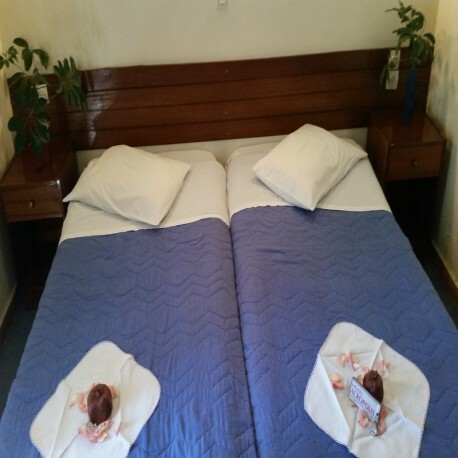 Welcome to Hotel Acropolis offering charming low cost modern accommodation in the heart of Corinth. The excellent central location of the Hotel Acropolis means that guests have the eternal city right on their doorstep. Two stars Hotel in the center of Corinth. Our main concern is to have a pleasant stay at Hotel Acropolis and to enjoy your trip in Corinth. Hotel Acropolis enjoys a central location in the center of Corinth, giving our guests maximum convenience for exploring the city. The staff at Hotel Acropolis is happy to provide professional service and personal assistance for everything you might need while staying with us 24 hours a day. Remain connected with complimentary wireless internet access included with your stay. We believe that the start of each day is of paramount importance. we offer you a greek breakfast in the morning to start your day. You can rent a bike to explore the city of Corinth and to visit all the places you wish. Rent here! You and your four-legged buddy go everywhere together, so why should your next vacation be any different? Whether your stay in Corinth is for business or pleasure we are confident that your stay at Hotel Acropolis will be comfortable. This is a double room with double bed or individual beds. They are equipped with a private bathroom with integrated shower, air conditioning, heating, TV and free wifi. This is a triple room with a double bed or two separated beds and an individual one.They are equipped with a private bathroom with integrated shower, air conditioning, heating, TV and free wifi.